I have seen beadboard popping up on ceilings all over the place lately. Combined with the right moulding it is pretty breathtaking. Kim's bead board ceiling in her laundry room is on my list of possibilities for the new house this summer. 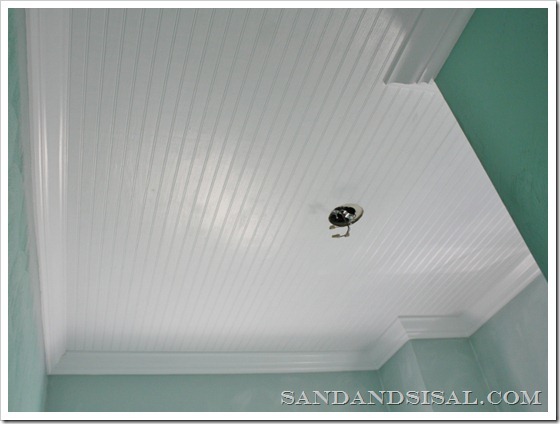 You can check out how to install a DIY beadboad ceiling over on her blog, Sand and Sisal. I love this! We will be doing this in our hallways once all that disgusting popcorn crap is gone. Great wall color too! Thanks Lorie! I appreciate the feature! Oh I love this and want to do this to our master bathroom... hopefully I can convince my hubby!